US car company Dodge has been criticised after an advert for the brand's Ram trucks, using excerpts from a speech by civil rights activist Martin Luther King Jr, aired during the Super Bowl. The advert used a speech made by Dr King exactly 50 years previously, alongside shots of US Marines, American football players, cowboys and trucks. Social media users were quick to react. After the advert's transmission, there was a huge spike in tweets mentioning either the company or Dr King's name. In the speech featured in the advert, Dr King talks about the value of service. "If you want to be important, wonderful," he says. "If you want to be recognised, wonderful. If you want to be great, wonderful. But recognise that he who is greatest among you shall be your servant. That's a new definition of greatness." The advert sought to highlight the work of Ram Nation - a volunteer organisation of Ram truck owners - and featured the strapline "built to serve". But many criticised the use of Dr King's words in this way. Several highlighted the ongoing controversy over NFL players kneeling during the national anthem to protest against racial injustice and police brutality. Black people cant kneel and play football but MLK should be used to sell trucks during the super bowl. Unbelievable. Others pointed to comments Dr King had made in the same sermon that were not included in the advertisement. "[Advertisers] have a way of saying things to you that kind of gets you into buying," he says. "In order to make your neighbours envious you must drive this type of car... Before you know it you're just buying that stuff. That's the way the advertisers do it." Some posted alternative videos using this narration instead. 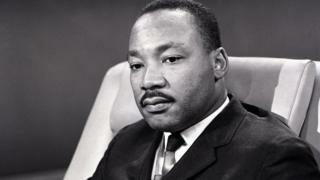 Did Martin Luther King achieve his life's dream? The use of Dr King's intellectual property, including his speeches, is tightly controlled by the King Estate. Intellectual Property Management (IPM) is the exclusive licensor of the estate. Managing director Eric D Tidwell said: "The overall message of the ad embodied Dr King's philosophy that true greatness is achieved by serving others". "When Ram approached the King Estate with the idea of featuring Dr King's voice in a new "built to serve" commercial, we were pleasantly surprised at the existence of Ram Nation volunteers and their efforts," he said. "Once the final creative was presented for approval, it was reviewed to ensure it met our standard integrity clearances." However, Dr King's daughter, Bernice King, distanced herself from the decision. Ram trucks subsidiary owner, Fiat Chrysler Automobiles, said in a statement on Sunday that they were "honoured" to work with the King Estate. "It is 50 years to the day that Dr Martin Luther King Jr gave such a tremendous speech about the value of service. Ram was honoured to have the privilege of working with the estate of Martin Luther King Jr to celebrate those words during the largest TV viewing event annually. "We worked closely with the representatives of the Martin Luther King Jr estate to receive the necessary approvals and estate representatives were a very important part of the creative process every step of the way."